The UNLP shall be concerned with the development and promotion of a multilingual communication and information platform that can provide equal opportunities for all peoples to share, access, and exchange their scientific, cultural, social and economic resources. The UNLP shall be a network of people engaged in the common endeavor of promoting the understanding, dialogue and peace among nations and making available to the global community the human knowledge generated by peoples of different languages. Undertake any other initiative that may be suitable and proper for the attainment of UNLP purposes. Universal Networking Language, which consists of the UNL relations, UNL attributes, Universal Words (UWs) and the UNL Knowledge Base. The DeConverter, the EnConverter, the Dictionary System and the Language Servers based on these software. A set of network system procedures to access the components in a) and b). Ad hoc working groups and other temporary units or services, may be established as required. Submit to the Board amendments to the present Statute. The President of the UNDL Foundation shall consider the methods of financing the UNLP with a view to ensure the effectiveness of its operations, their continuity and expansion. He shall also consider the various kinds of arrangements under which institutions and individuals may be associated with its work, and ensure that they meet the highest academic standards. The President of the UNDL Foundation shall ensure that the UNLP has adequate resources so that the academic staff, equipment and working conditions meet the highest standards for research, development and training. The UNL Center shall have the overall responsibility for promoting and coordinating the UNLP and, in particular, the development and maintenance of the UNL system. This shall include, among other functions, fostering the technical performance of the UNL system and setting up an infrastructure to make it operational. Promote exchanges of scholarly, scientific and technical ideas and information within and outside the UNLP community. Serve as depository of information regarding the expertise available on subjects of relevance to the work of the UNLP and maintain an up-to-date roster of qualified scholars in the field of research of Natural Language, Linguistics and Computer Science, and assist UNL Language Centers in finding competent scholars as necessary. The Director of the UNL Center (the Director) shall be appointed by the President of the UNDL Foundation as the chief academic staff of the UNL Center, and shall have overall responsibility for the direction, organization, administration and programme of the UNLP. Coordinating the research, development and training programmes in the UNL Center in collaboration with the Language Centers and other research and development programmes of the world scholarly community. Article VII. UNL Language Centers. A Language Center shall be a public non profit entity established according to the legal framework of the country where it is located, and shall comply with the technical, staffing and administrative and other conditions specified by the UNL Center. To be eligible, a given institution shall meet the technical and administrative standards specified by the UNL Center. Procure the necessary financial means for the support of the LC and UNLP operations. When necessary, National Units shall be established by the President of the UNDL Foundation, upon submission by a LC to the Director of the UNL Center and after the satisfying the conditions established by the UNDL Foundation. A National Unit shall facilitate the coordination of the development UNL system and the assistance to its users in a given country. It shall provide technical support and manage the relationships with users and the public within the geographical boundaries of a given nation. Report annually to the Language Center that operates on the geographical area where the Language Center operates. 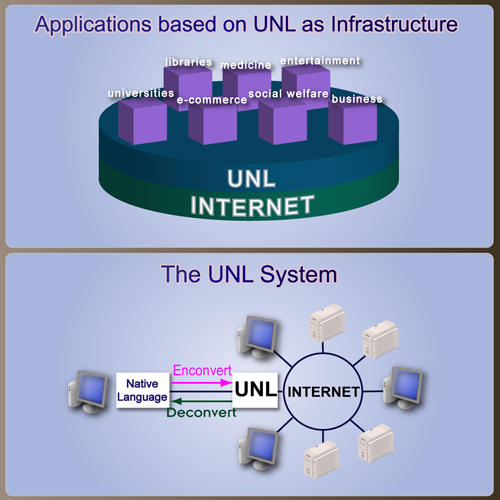 The UNL Networking Working Group shall work on how to utilize the UNL System through any kind of network. The UNL Tools Working Group shall provide tools to use and maintain the UNL system. The UNL Resources Working Group shall integrate the current dictionaries and corpora and provide new dictionaries and corpora. The professional and support staff of the UNLP shall be selected in accordance with the principles of efficiency, competence and integrity of the UN and with a view to achieving the highest performance of the UNL system. The contractual regime and work assignment shall be established in accordance with the provisions of the Statutes of the UNDL Foundation. The financial support for the UNLP shall be secured through contributions of various kinds, and through income derived from its operations. Contributions which may directly or indirectly involve an immediate or ultimate financial liability for the UNLP, or which involve a new activity not yet included in its programme, may only be accepted with the approval of the UNDL Foundation Board. The funds of the UNLP shall be kept in a special account to be established by the President of the UNDL Foundation, managed and audited in accordance with the United Nations practice. The funds of the UNLP shall be held and administered solely for the purposes of the UNLP. The President of the UNDL Foundation shall perform all necessary financial and accounting functions for the UNLP, and shall prepare and certify the annual accounts showing the status of the UNLP?s special account. The President of the UNDL Foundation shall prepare the budget estimates for the UNLP in a manner consistent with the United Nations practice, and shall be submitted to the Board for approval. The UNLP shall have its headquarters at the UNL Center in a place to by decided by the President of the UNDL Foundation, in consultation with the Director of the UNL Center. The current headquarters of the UNLP shall be at the premises of the UNDL Foundation in Geneva. The UNLP shall enjoy the legal status and programmatic flexibility provided by the UNU/IAS statute, adjusting them to nature of it s needs and operations. The present Statute may be complemented by Annexes, which shall define procedures, criteria and modalities for the application of statutory provisions. Such Annexes shall provide the necessary flexibility, effectiveness in managing of the UNLP. Amendments, revisions and additions in these Annexes shall be approved by the President of the UNDL Foundation. Adjustments to current UNLP structure and operations shall be introduced as the UNL system evolves, and a reformulation into a new organizational structure may be established as the UNLP expands. Amendments to the present Statute may be made by the President of the UNDL Foundation and submitted to the Board for approval. Creation of UNL Language Centers. Administrative conditions, including juridical status of the institutions and of the LC, and the degree of operational autonomy of the latter. have the necessary means to have the technology transfer activities to the mebers of the UNL Society whose activity is related to the language in question. promote and diseminate the activities of the UNLP .